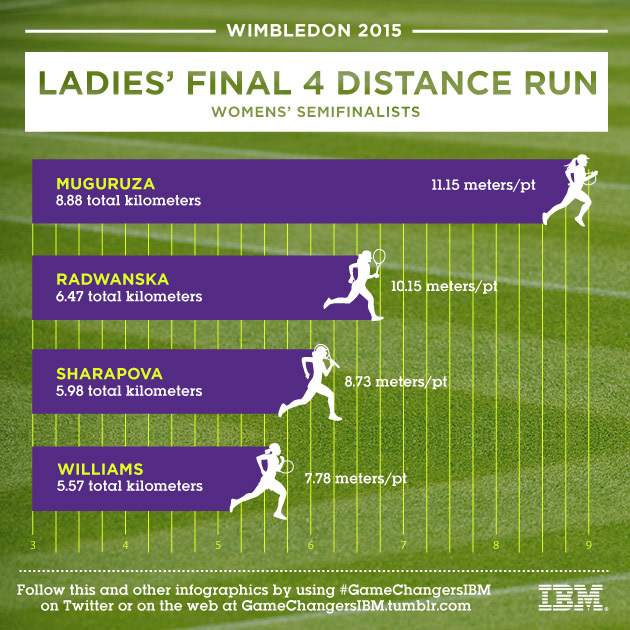 A look at the total distance run by each of the Wimbledon 2015 women's semifinalists, Garbine Muguruza, Agnieszka Radwanska, Serena Williams and Maria Sharapova. Of the final four remaining players on the women's side, who has run the most on court in the previous matches? Garbine Muguruza has covered the most distance on her road to semifinals. She's put in more than two kilometers than her semifinal opponent Radwanska. On the other hand, Serena Williams has been the most efficient and has run the shortest distance. The semifinals feature two matchups of the players who have run the least—Serena and Sharapova—and the players that have run the most—Muguruza and Radwanska, making for a contrast of quick points versus longer rallies in the matches.